Description: This romantic A-line features layers of tulle and allover lace. 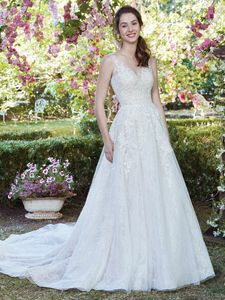 Beaded lace appliqués dance over the bodice, complete with illusion straps, a scoop back trimmed in illusion, and V-neck. Finished with covered buttons and zipper closure.